Next Sunday is Mother’s Day, a commemorative day established by Anna Marie Jarvis in 1911 as a tribute to her mother and all mothers. In 1911 the day usually involved church services. Over time the celebration evolved into a sentimental event with all manner of gifts and cards for mom. In recent years mothers, daughters, and granddaughters gather for what is called a Mothers Day Tea, a pleasant event with pretty table decorations, good cheer, finger food, and, of course, tea or an alternate beverage. WHY IS AFTERNOON TEA A FEMININE PURSUIT? This pleasant custom raises the question of why Afternoon Tea is often considered a feminine pursuit. I don’t mean men never indulge, but while you may see a group of women enjoying Afternoon Tea, you seldom, if ever, seem men doing the same. With that question in mind, I checked into this elegant pastime. First, it’s worth noting there is more than one meal that uses the term “Tea.” There is High Tea and Low Tea, terms based on the height of the table. High Tea, eaten between the hours of five and six o’clock, is a full evening meal enjoyed at a table of standard height by the entire family. Low Tea, served at a low table, is a synonym for Afternoon Tea. The custom arose from the availability of tea, the distance of time between breakfast and dinner at eight o’clock, and the opportunity for women to gather and discuss the news of the day. In the 18th century, servants often were banned so their employers could gossip freely. Though tea drinking was already popular, Anna (1783-1857), Duchess of Bedford, created the mid-afternoon event that became Afternoon Tea. By four o’clock, Anna was too hungry to wait until dinner. So she sent for a pot of tea, bread and butter sandwiches, and cake to be served in her bedroom. Anna often entertained in her rooms. At her London house Anna invited people to join her for “tea and a walking in the fields.” The custom caught on, and the venue moved into the drawing room. Tea at four concluded at the perfect time to join in the evening promenade in Hyde Park. 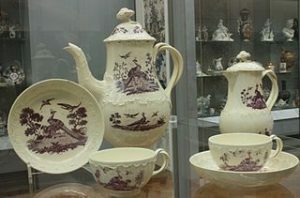 The growing popularity of tea among all classes inspired a new porcelain industry to produce the appropriate dishes for enjoying a cup of tea. Original tea potteries included Wedgwood, Royal Doulton and Aynsley. The custom of “steeping” tea leaves meant the pot needed to be covered so the liquid would remain hot while the leaves steeped. Ewers once used for wine evolved into the modern tea pot. Pots with small bases and wide spouts don’t clog as easily. In this illustration the tea pot is on the right hand side towards the back. The taller vessel is a coffee pot. The cups evolved from Chinese porcelain cups. The English added the handle and saucer. As refreshments became standard, the two or three tiered tea stand joined the teatime dish ware. Savory foods, usually sandwiches, were at the bottom and sweeter foods at the top. The top tier was reserved for scones so they could be kept warm by a warming dome. These were served with cream and jam. The middle plate is for cakes, petits fours, and marzipan. And the bottom is for an assortment of finger sandwiches. Today this is generally a sampling of egg mayonnaise with cress, smoked salmon with cream cheese, coronation chicken or some other chicken based filling, and ham and mustard sandwiches. Tea offerings usually include Assam, a strong bodied tea from India; Darjeeling, also from India; Earl Grey, a black tea with oil of bergamot, and Lapsang Souchong, a Chinese tea fired over smoking pine needles with a strong smoky flavor. Other teas and infusions can also be offered. And then there’s Tea Etiquette which includes how to pour the tea, how to hold the cup, how to drink the tea, the correct order of finger food consumption, and other delicate maneuvers. This may be why champagne is often offered as part of Afternoon Tea. And may also explain why men are less enamored with the custom than women, many of whom had tiny tea sets from which they served imaginary tea when they were children. For a change of pace, I found a video from the BBC program Two Fat Ladies in which Clarissa Dickson Wright and Jennifer Paterson prepare sandwiches and a pastry for tea at a cricket club. It’s hard for me to picture either of them following the correct social procedures in involved in Afternoon Tea. The video is about nine minutes. I wish you a pleasant Mothers Day, no matter where you are in the generational tree. And if you receive an invitation for a Ladies Tea, so much the better. 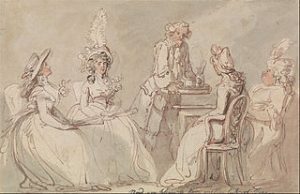 Ladies at Tea by Thomas Rowlandson. Public Domain. 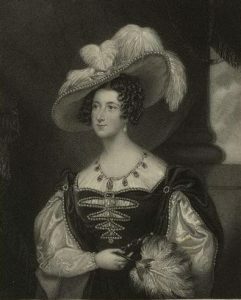 Anna Maria Stanhope, Duchess of Bedford, 1820. Public Domain. Staffordshire Tea and Coffee Service by Valerie McGlinchey. Creative Commons Attribution. 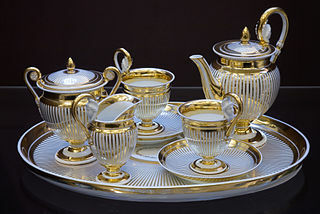 Vintage Tea Service, 1822. Vienna Porcelain Manfactury by Jorge Royan. Creative Commons Attribution. “Tea Time Etiquette and the History of Afternoon Tea.” An Afternoon to Remember. “What is Afternoon Tea?” Afternoon Tea. David Ross. “Tea In Britain.” Britain Express.